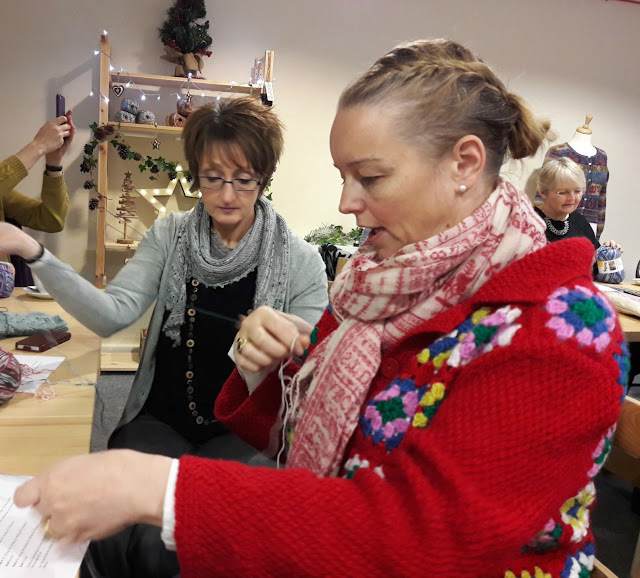 Lynne Rowe (on the left) and the equally talented Emma Varnam again (we three last met up at the knitted bird workshop). 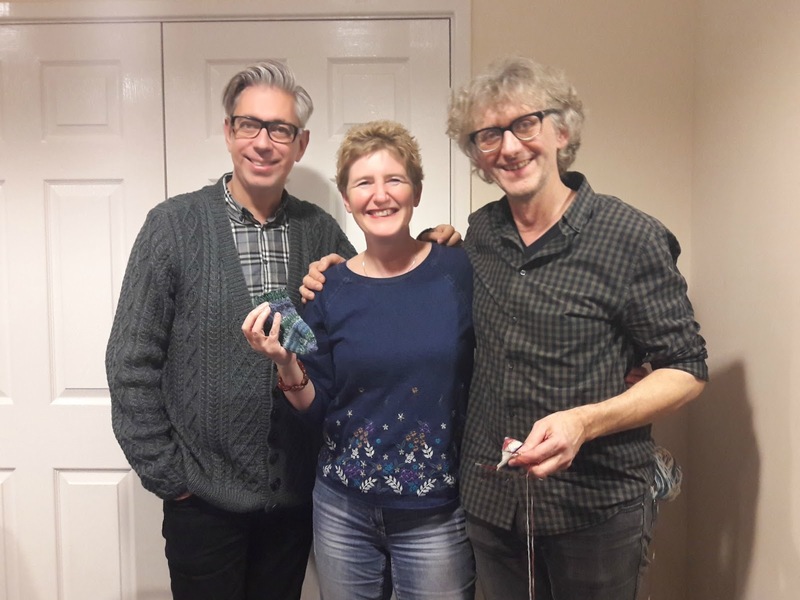 They are both crochet designers who also knit and are good fun to spend the day with. I love taking photos of people when they're busy - here, we were just about to cast on! 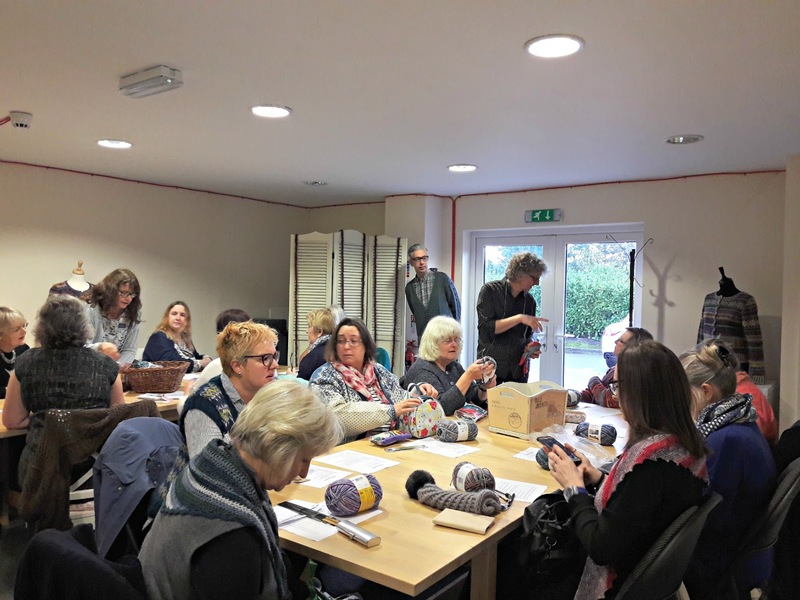 Plus, the workshops at Black Sheep are always well-organised with an excellent lunch, cake (of course) and cups of tea to keep us going - it couldn't be a better way to spend a Thursday! The socks that we were knitting were toe-up socks with an afterthought or Russian heel. 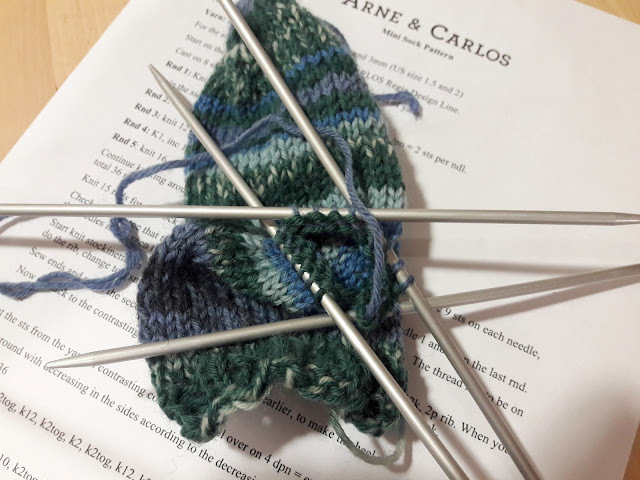 I am often asked about both of these things; I have knitted toe-up socks before but they're not my favourite way to knit socks and I wanted to see if Arne and Carlos' method was any more straightforward. I've never used an afterthought heel before - there are so many things that I want to try and there's never enough time to do them all, so time away from home with the specific intention of trying this heel out seemed like a good idea! If you've never seen an afterthought heel before, it looks quite different to the heel flap and gusset heel that I use; it's quite pointed and you can't quite imagine that it's going to fit properly but Arne and Carlos assured us that it does. I'm happy to be convinced! For this workshop, we were asked to bring 3.5mm needles and were each given a ball of Regia Design Line Arne & Carlos 6ply to work with. I usually knit 6ply socks on 3mm needles but my sock has turned out well on this size; sometimes yarn is slightly thicker from one manufacturer to another which is why a tension swatch is always a good idea! I chose shade 3658 Winter Night which comes in a 150g ball so there's still plenty of yarn for a pair of socks after the workshop and is a lovely mix of blues and greens. The 6ply matches the 4ply shades in the same collection - great if you like thicker socks! The plan was to knit a small sock to show the techniques and then transfer those techniques to a larger pair after the workshop. It makes sense to do this when you only have one day to get through everything, although I did have to remember to keep stopping to take lots of notes as we went along so that I'd remember what to do later on. 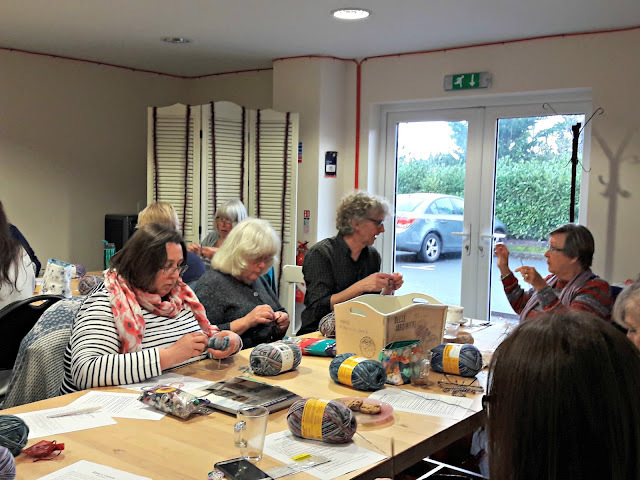 There was such a hum of excitement in the room as we settled down to knit some socks which soon gave way to concentrated silence. The sock knitting had begun! The last time I knitted a pair of toe-up socks, I used Judy's Magic Cast-On but of course it was such a long time ago that I'd completely forgotten how to do it so I just used my usual cable cast on. That's the joy of a small sock that's not intended to be worn, I guess - it doesn't matter which cast on you use as it's never going to rub your toes! I will have to brush up on Judy's cast on for my own pair, though, there's no way I could wear socks with a big seam at the bottom these days now I've been spoilt with grafted toes! 6ply knits up very quickly on 3.5mm needles and it wasn't long before I was at the point where I was ready to start my heel. Look at that! A toe-up tiny sock ... or part of one, at least! It's quite fiddly knitting such a small sock on DPNs but at Arne's suggestion I changed from my usual English style of knitting to continental (get me, switching styles! ;) ) and it certainly stops the needles flapping about quite so much. I know that DPNs are much more widely used in Europe and Scandinavia and it made me wonder if the reason was because of their knitting style as much as being the way they were taught. It's much more economical of movement and was a significantly more pleasant experience than using my English method. I also tried out the Norwegian way of increasing stitches by knitting into the one below and that's surprisingly easy and effective too, although Arne said it doesn't work in colourwork knitting. That, I think, is the real magic of going to a workshop; whilst there might be a plan for the day that you follow, there's always something new in a conversation that you can pick up that you might never have known otherwise. There's always lots of opportunity to ask questions as Arne or Carlos is usually sitting at your table and it all makes for a very companionable time. Not only was I able to ask questions about toe-up socks that I didn't know the answers to, I know that it's been snowing in Norway and Arne and Carlos were skiing before leaving for England last week, I know that their house is only 10 minutes from the nearest grocery store and I know that it only takes about an hour to get to Sweden from where they live. Oh, and that Arne has a knitted tinsel obsession, but more of that later! 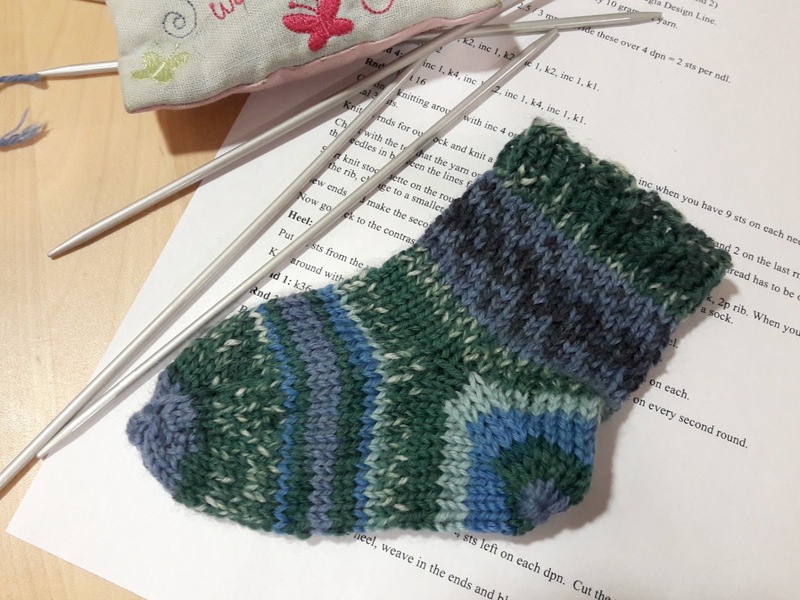 After lunch, it was time to start the heel. If you've ever added a thumb to a mitten using waste yarn, then you can create an afterthought heel; it really is very easy and I know that it's lots of people's favourite heel for that reason. 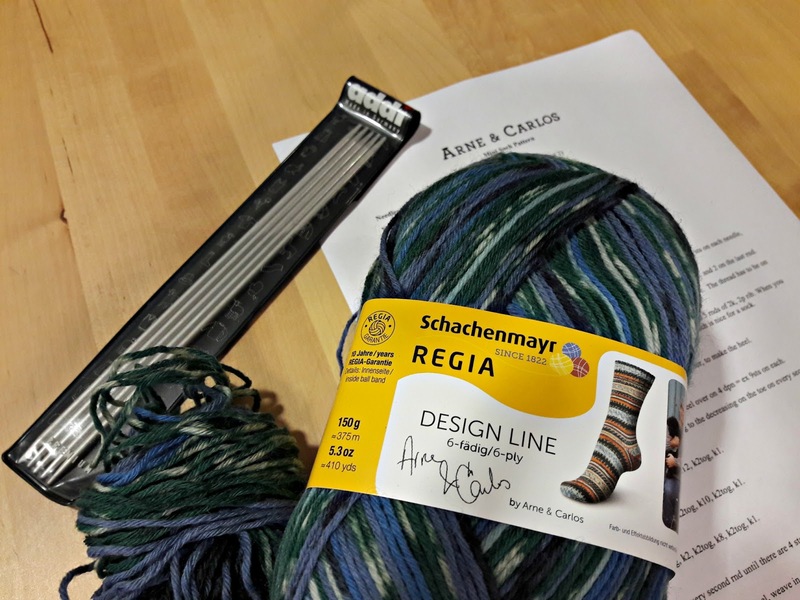 I'm not sure that I'd want to change from my heel flap heel for the majority of my socks, but it's always good to have choices and I think this is faster to create than a short row heel. 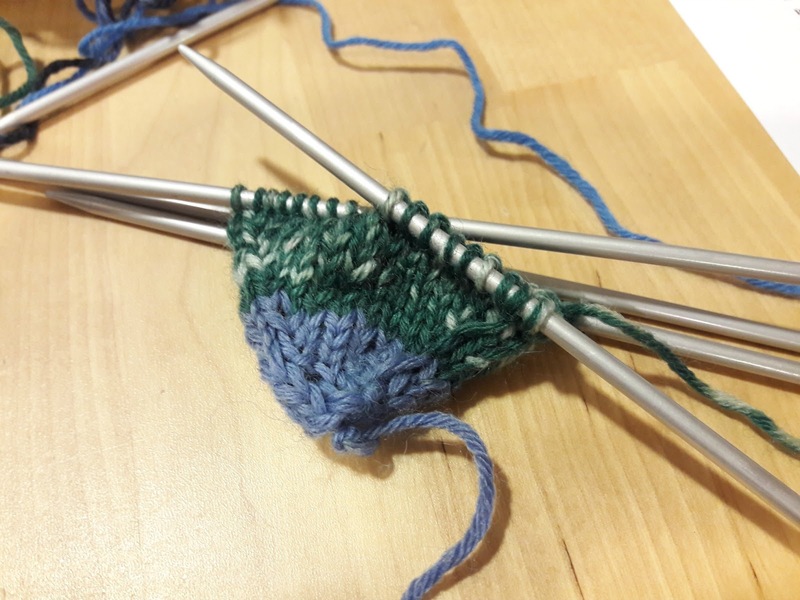 The trick is to make sure that you've made the foot of your sock long enough because you knit past where the heel is going to go before you start the heel. I could imagine that if you tried it on later and it wasn't quite right it would be a real nuisance to have to unravel the heel and the leg of your sock, but of course that will all be down to practice. I forgot to take a photo of the waste yarn on my sock so here's Lynne's sock with the waste yarn for the heel knitted into the fabric. Can you see it? It's the line of yellow stitches that don't match anything else. To create the heel, you pick up the stitches around the waste yarn and then take the waste yarn out so that you've got a hole to knit around (I don't know how well you can see that in the picture above but that's the point that I'm up to). It really doesn't take long after that to finish the sock - ta dah! You finish up the heel by drawing the yarn through the stitches and pulling them tight; I'm not sure how comfortable that would be on "real" sock but Carlos assures me that it is. 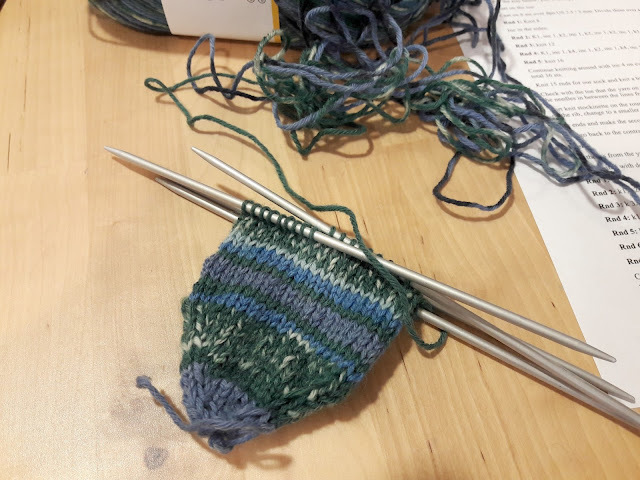 I even had their sample sock on at one point and he was pulling the heel into shape so that I could see how it worked (I also know that my feet are considerably smaller than theirs!). 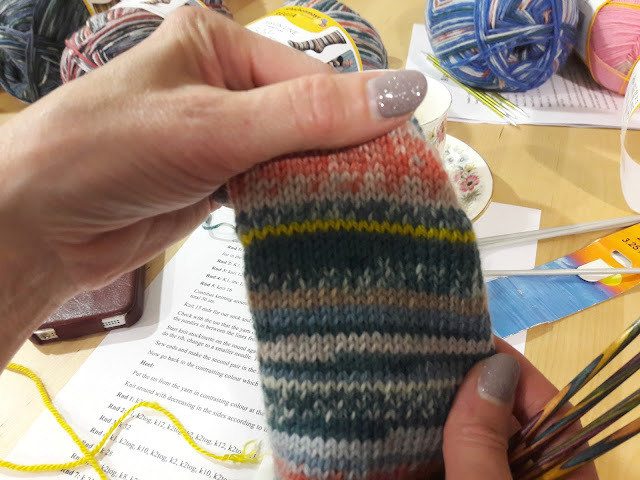 The sock needs to be quite tight-fitting so that the heel pulls itself into the right shape so it's important that you get the foot right. I'm looking forward to trying this out! I have another distraction at the moment which I was reminded of on the day ... Arne's obsession with knitted tinsel! He talked about it the last time I saw them whilst Carlos rolled his eyes in good-humoured exasperation (apparently they have over 60 metres of the stuff in their house already and Arne was still buying more yarn ...) and after watching him turn a ball of tinsel yarn into knitted tinsel by knitting an i-cord on DPNs, I decided that was just what I needed to replace the broken garland that we have always wrapped around our stairs. 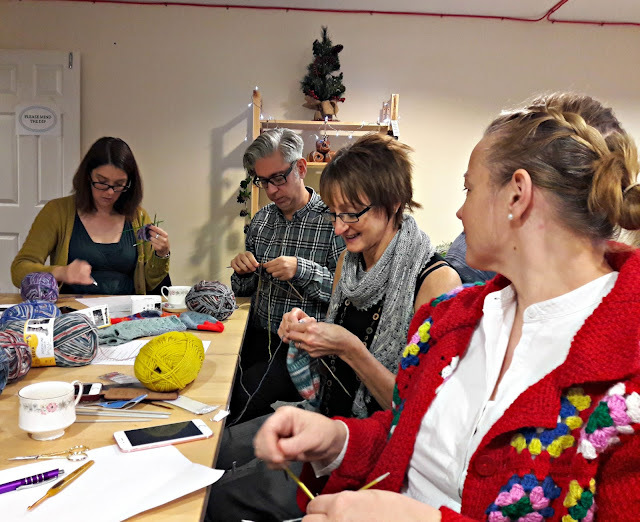 I've been promising myself that I will knit something to replace it and every year, I remember when the decorations come out which is far too late to do anything about it. 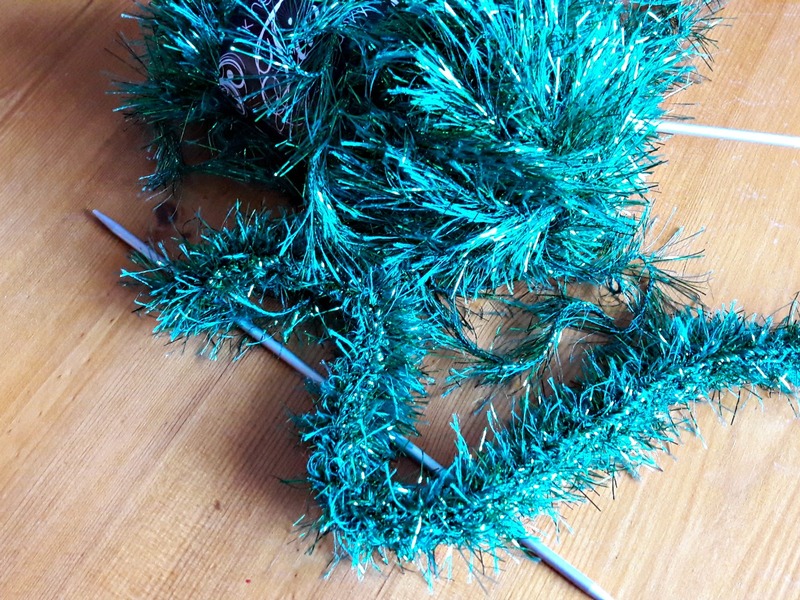 This year there will, with any luck, be a new tinselly garland with twinkling lights (if I can remember where I've put them) and I can finally say goodbye to the old broken one instead of trying to patch it together with bits of green garden string. 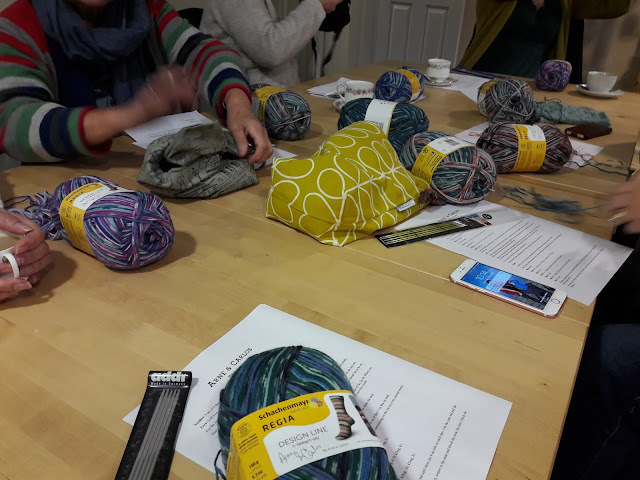 The yarn is King Cole Tinsel Chunky, it comes in a ridiculous number of colours, it's really not very easy to pick up dropped stitches (ask me how I know this!) and it looks fabulous knitted into i-cord. I'm using the shade emerald which is a proper GREEN, not the rather odd colour in the photo, and I know it will be perfect for our stairs. I'm using 4mm DPNs and I cast on 4 stitches to make the cord. 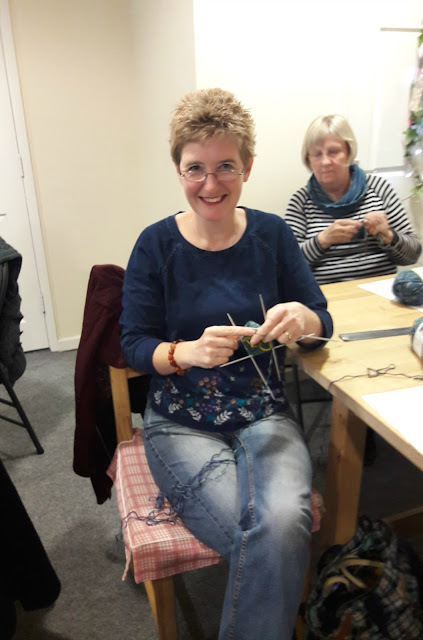 It's very easy to do - you knit the 4 stitches then slide them back up your DPN and knit them again, pulling the working yarn back to the beginning of your stitches and keep repeating that process so that it brings it round into a cord. 4mm needles are giving me a nice chunky cord which will look good on our stairs, but I imagine you can use whichever size of needles you want to. These workshop days are always over far too quickly and it's time to pack up and leave. Not before photos and hugs all round, though, so here I am, with my favourite Nordic duo and my small sock. my preferred sock is knitted toe up so I would be interested in this heel method. What a fantastic day - serious yarn envy! Thanks for sharing. These fellas are two of my favorite humans ever. I've attended a few workshops with them here in the States, and they never cease to delight and amaze. When you make "their" socks please let us know how that heel goes--it looks like it shouldn't be comfortable, but I can't imagine it's not. I'm very jealous! Would have loved to take part in this workshop. The afterthought heel is on my list of things to learn. It sounds as though you had a great day. It's always fun to learn new techniques. Thank you for sharing your day with us. Love reading your posts. They make me happy!! And yet another method to add to my never ending “must try” list. Thank you. Please share a photo of the tinsel on your stairs when you've finished knitting and decorating. I don't know if the tinsel is wrapped with the boughs of branches or if it's by itself. Is it like tinsel or garland some use on their Christmas trees? The sock looked interesting but I don't understand how the heel is done. I think I'd have to see it in person. Thanks for sharing with us. Told you afterthought heels were great fun. You sound as if you had a great time. Knitted tinsel! Genius! I used their video tutorial for these socks for my husband and although I wasn't sure about them he loves them and much prefers the fit. It looks like such a nice relaxed day. 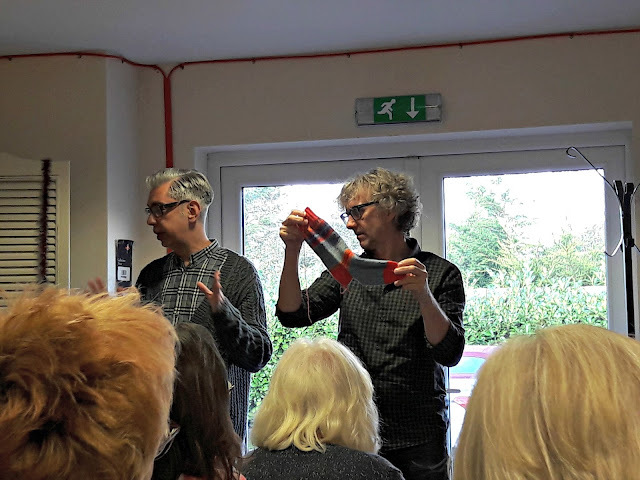 Looks a fun day you all had, how fabulous to meet Arne and Carlos and learn from them. Lucky you. I wish I had been there.